Environmental health officials are concerned that burial space in Pointe Michel and Roseau remain scarce and not much is being done by the authorities to improve the situation. Speaking to the SUN in an exclusive interview, Chief Environmental Health Officer, Anthony Scotland said: "Generally the Roseau and Pointe Michel cemeteries remain the same since 2005 when the situation first surfaced. We have to find a way to manage the burial of people in those areas." He said that the cemetery in Massacre, which was the burial ground for the Parish of St. Paul and which was an issue in 2005 is now under control. "We now have a new cemetery in Mahaut, so that has released the pressure on the Massacre cemetery," he said. "It is now functioning despite the fact that certain infrastructure still needs to be put in place like the roads, drainage, walls- since it's like a slopping piece of land...a river is also in very close proximity and it poses some issues but I have already had discussions with the Village Council in that community and have a plan of action to make Mahaut into a model cemetery," he stated. Scotland is of the view that if planned properly, the Village Council can earn revenue from the burial ground since people are now demanding a change to the traditional style of burial; they want to move to a vault-styled burial structure and occupy land in the cemetery to put in the infrastructure. "The law says graves must be fenced and marked and that is not done. Depth for burial is 7ft and we have an issue in many places that this is not being adhered to. Also, the law says that the graves should be two feet apart and that is not also being done. You cannot just put people on people; you have to give them space. The legislation also speaks about the role of the grave diggers since they are the ones to prepare and mark all graves and we just don't respect them," Scotland said. 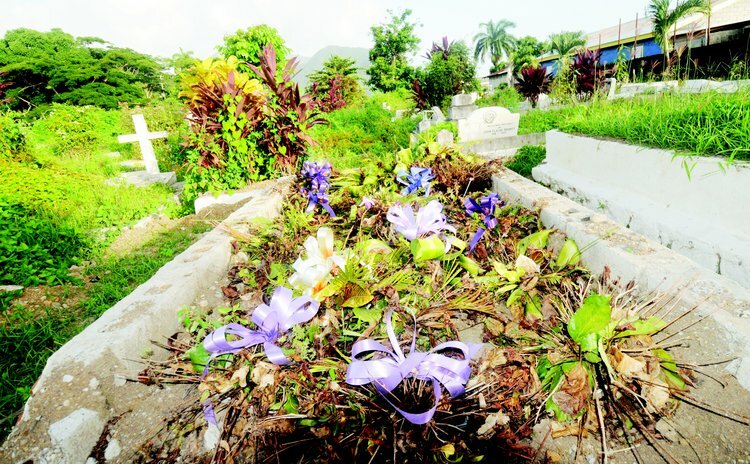 He added: "Either later this year or early next year, we are going to be holding a symposium where we will be bringing all stake holders to look at cemeteries in Dominica and to also look at the legislation which is very inadequate. We need proper registration of deaths, keeping records, proper mapping of the cemeteries, its maintenance since they are also breeding grounds for mosquitoes and rodents. We are very concerned about the cemeteries which are not well kept... action needs to be taken. A cemetery is a historical place of information and this need to be maintained." The Chief Environmental Officer also spoke of what he described as "a major issue in Dominica." An increasing number of Dominicans are applying for permission to bury their loved ones on private lands. The administration needs to come up with some guidelines in that regard, he said. Scotland said the Medical & Services Act Chapter 150 states that no burial ground shall be less than 100 yards from any home, and that the local authority and the environmental health officer must give you permission for burial.